← CLUTCH OF 3 WHITE EGGS HATCHED AUGUST 4, 2011 – 5 DAYS LATER THAN EXPECTED. I am pleased to be able to take some decent photos of recent hatchlings as of my trail check on Monday, August 8, 2011….two photos below represent the clutch of unusual white eggs–those babies are 4 days old. The other photo below those is of 2-day old babies. It never ceases to be a joyful experience to monitor nestboxes and find new life. The anticipation of the eggs to finding a hatching has taken place is the best feeling! Enjoy! The trail is winding down for the season. I don’t expect any more nestings to take place. 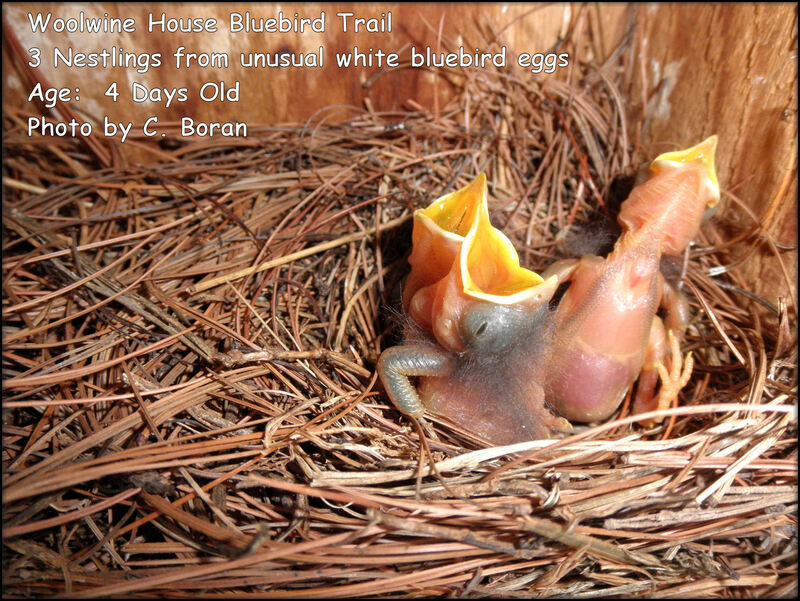 Soon the fun really begins–collecting and analyzing my trail notes for the nesting season, summarizing them and writing notes of those summary findings, and then submitting those summary notes to the Virginia Bluebird Society. Those state records will go to the North American Bluebird Society, along with the rest of the state records around the country from the other bluebird societies. This includes the records of other species of birds occupying the nestboxes. This is how we know how the birds are doing, year after year. If House Sparrows tried to nest in these boxes, the records of the nest attempts and evictions of that non-native bird is included in those notes. Any predation, unhatched eggs, number of eggs, problems during the nestings and how treated, and the number of successful fledged birds is included. 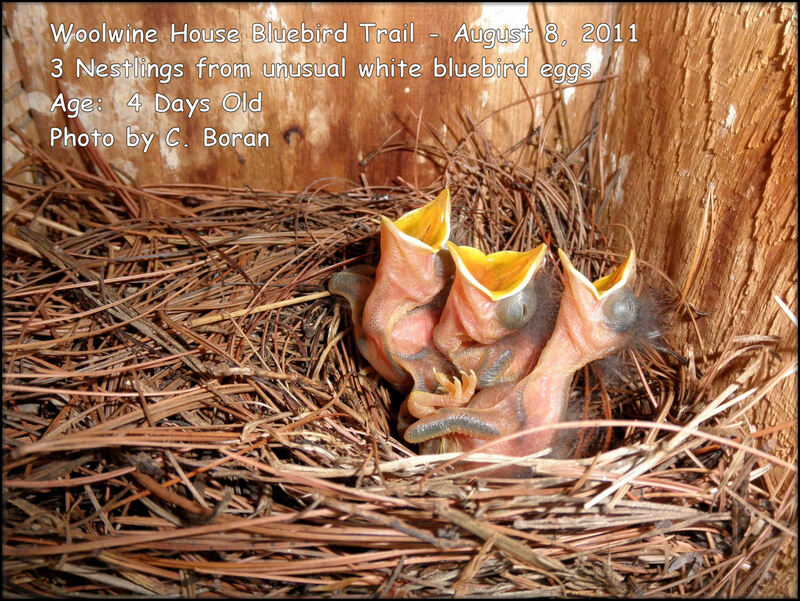 Some trails have more than one style of bluebird boxes–those notes are also sent to VBS. These guys are growing! One thing I look for at this stage, as a monitor, are any welts on their tender skins for any blowfly larvae which latch onto baby birds at night. Since I treat ALL my nests for blowfly infestation (I have this problem in every box and in every nest! ), I can see how the treatment (very carefully administered!) 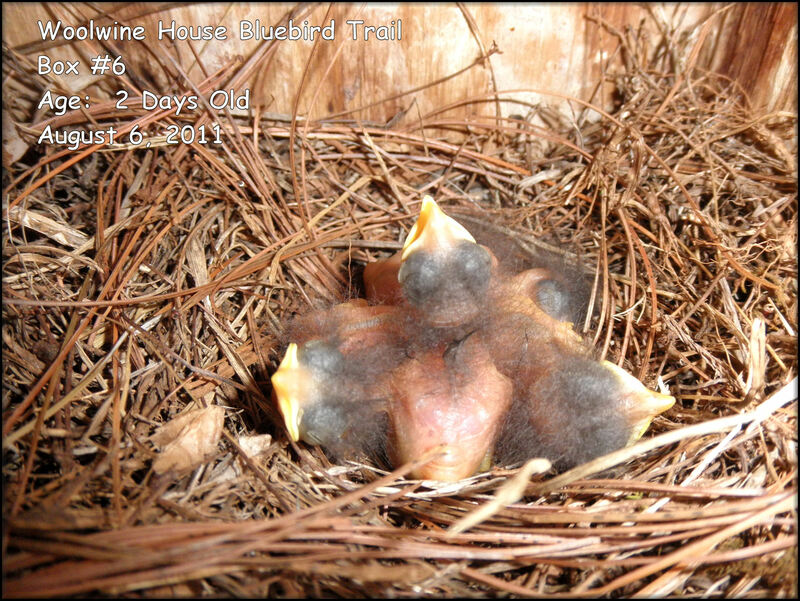 is working to help these little guys grow naturally, safely, and survive to fledging day. These little ones look great! I am very pleased! This is my first ever WHITE eggs and hatching from white eggs that I have experienced since bluebirding started for me Spring 2006. Fa-La-La-Laaaaaaaaaaaaaaaaaaaa! These-4-day olds are ready for WHOLE grasshoppers now! "Hi, there. Now that you've seen us, can you please leave now so Mama and Papa can bring us some yummy food?" Look closely....you'll count 4!